Heist missions have finally been revealed for Grand Theft Auto Online—GTA 5's self-explanatory online mode. Okay, so the "finally" of that sentence is somewhat bitter-sweet, given that on PC we're still waiting for GTA 5's January release. Here's the important bit: GTA 5's online mode didn't previously have heists—one of the best bits of GTA 5's singleplayer campaign. As of "early 2015," though, it will, and the above trailer confirms that they're coming to the PC version as well. IGN has an informative interview on what the feature will entail, and also questions why the co-op heist missions took as long as they have. "They just turned out to be a lot more difficult than we originally thought," said GTA Online producer Imran Sarwar. "One of the challenges is that unlike a heist in Story Mode," Sarwar later said, "every player needs to feel central to the action at all times, and that’s much more challenging than it appears." In the singleplayer game, players can switch between characters to ensure they're always at the centre. In online play? Not so easy. Sarwar uses the example of a getaway driver, and needing something for that player to do that isn't just sitting around and waiting in a car. 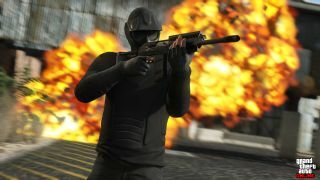 The co-op heists will be four player multi-segment missions, and, according to Sarwar, will be organised by a designated "heist leader" among the group. As for the missions themselves, "some missions have all players working as one unit, some require players to take on specific tasks like hacking or crowd control, while others require players to split into smaller teams to complete separate high value objectives." With no exact release date, it's not clear if online heists will be ready for GTA 5's PC release. That, if you weren't already counting down the days, will happen on 27 January.